Welcome guest blogger Anna Sparks! 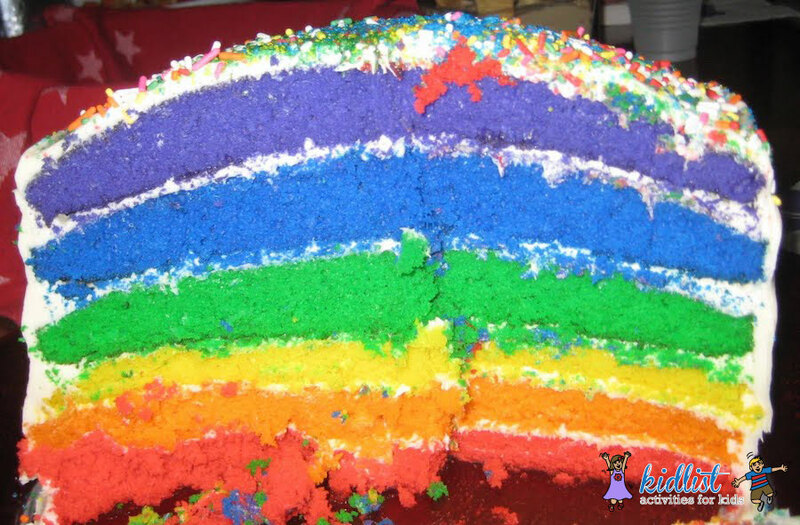 I love this rainbow cake that she made and wanted to share with everyone…. Just take a look at the picture and you will want to make this cake with your kids! I saw this online and just thought it would be so much fun to make. Also the different dyed cakes started me spinning all kinds of ideas (Halloween cake – orange, black, and yellow; St. Pat’s cake – layers of various greens, Christmas cake – red and green; 4th of July – red, white, and blue – you get it!) So I decided to make this cake the next time I would have an opportunity to serve it to a whole bunch of kids. Because who could love a rainbow cake more than a bunch of two and three year olds? This week was our turn to host playgroup and the rainbow cake immediately popped into my mind. So my son Ben, who is two, and I set about making it. It’s not an easy project, it takes a bit of time, but almost all the steps are suitable for kids. 2 boxes of cake mix in any white color – they sell “white cake” but when I went to the store they only had “French vanilla” which looked pretty white so I bought that. Mix the cake as usual. If you only have one oven (like I do), I suggest doing one box at a time. Kids help: My son loves using the mixer or the blender with me. I would like to think he is a budding pastry chef but I’m pretty sure it’s just the “machine” element of these appliances! Add food coloring to each bowl. Kids help: By doing the mixing. It’s also a great opportunity to talk about colors. Kids help: By tracing circles on the wax paper with the cake pans so Mom/Dad can cut them out . Kids can also spray the Pam with a little bit of help! Cook the cake ALMOST as directed. We learned two new tricks online which is really helpful for this cake which has lots of layers. With a multi-layer cake, you want each layer to be flat so they stack really well. First, lower the temperature on your oven by about 25 degrees. Our recipe called for 325, we lowered to 300. Then increase the cooking time by about half. Our cooking time according to the box was 20-25 minutes. We baked our cakes for 30 minutes. Second, wet an old, clean towel and wrap it around the cake pan and fasten the ends with a safety pin. This helps the heat to distribute more evenly through the cake and makes it so your cakes don’t have domed tops. If all of this sounds too difficult, you can just cook your cakes as normal, throw them in the freezer for about an hour after they are cooled, and cut off the top (the dome part) with a bread knife. Works just as well, you just lose a little of your cake! After the cake has cooled completely (and you’ve made all six layers), I suggest putting the layers in the fridge for at least an hour. They are easier to work with this way. Now the cake stacking begins – lay all of your cakes out and decide what order you are going to do them in. If you want a true rainbow go – red, orange, yellow, green, blue, purple. But that is part of the fun of the rainbow cake – you can put them in whatever order you want. After the first layer, put on a layer of white frosting. Kids are pretty good at dumping a bit of frosting on and then Mom/Dad can spread it out. Construct all of your layers like this and then frost around the sides and the top with a thin layer. This is the crumb-sealing layer. It doesn’t matter if your frosting looks ugly right now, you will be able to cover it up. Put in the fridge for twenty minutes. Put the final layer of frosting on and let the kids decorate the cake!! We used lots of sprinkles, but older kids might even be able to manage some more elaborate decorations! Sound too hard, don’t have enough time, or you’re not a baker? There are more rainbow cake options out there that don’t involve six layers. Check out this link. Sound too easy, you are a natural baker, have a kid who is wonderfully creative, or you want to torture yourself? Check out this link. 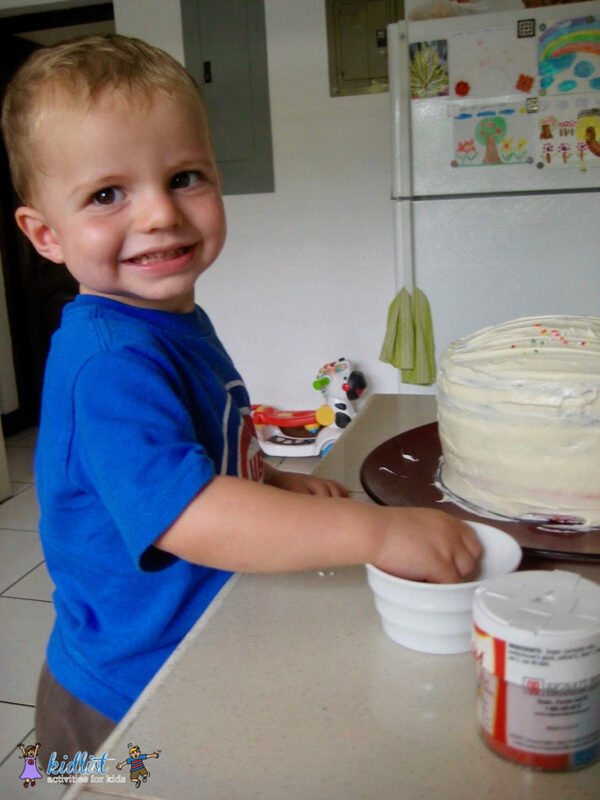 Make the cake as directed and frost only in between layers, then cover it with fondant and invite your kids to decorate it with AmeriColor Food Colour Markers!! So cool! Be the first to comment on "How to Make a Rainbow Cake: Directions and How Kids Can Help"